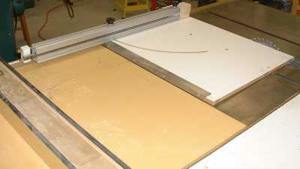 A crosscut sled is an indispensable addition to your table saw. It can replace your miter saw with the proper attachments. Check out this free woodworking plan to make your own. This handy tenon jig was designed to securely hold the workpiece for cutting tenons on the table saw or the drill press. A combination of T-Track, hold down clamps, toggle clamps, and stop blocks permits you to clamp the work piece in the desired position so your cuts are accurate and true. Whether you call it a Table Saw Jig, Table Saw Sled, or Crosscut Sled, this table saw accessory will be one of the most important tools in your shop. With typical miter guages, the blade tends to pull the work away from the fence. This tool allows you to clamp the workpiece at the exact angle you need.